To say I am an animal lover doesn’t begin to describe the breadth and depth of the love and respect I have for all living creatures. I love all animals without discrimination. I refuse to kill a spider or bug just because it has the audacity to have wandered into my home. As a matter of fact, last Saturday while at a retreat a fly made it’s way into the room and was buzzing around creating a bit of a distraction to those of us that were trying to meditate. Okay, it was causing me to be distracted while I was trying to meditate. As I watched the fly slowly moving around I thought to myself; if I can catch that fly I will release it outdoors. I smiled as I had the thought because there was no way I was going to be able to catch a fly! I’m not some Kung Fu master after all. However, about 20 minutes later we were getting ready to move from a seated meditation to walking and when I looked down that fly was sitting about six inches from me. As I slowly moved my hand towards this tiny creature it didn’t move at all. I was able to cup my hands around it and pick it up. Once it was safe and secure in my palm I was able to move it outside and place it on a tree. Only then did it begin to move it’s wings, indicating that it was going to be okay. I was relieved. Some might find that story silly or a waste of time but me, well I look at it as saving a soul or another energy source that has no more or less value than I do. I was grateful for the opportunity to be of service. Service. This word has many meanings but in the context in which I am using it, it means this: an action to help some being. In this case; a fly. One person that is famous for giving or doing service is Oprah. I was watching her one day many years ago and she was doing a segment on Wyatt Webb. He had written a book called It’s Not About The Horse wherein he talks about how horses can and will mirror a humans emotions therefore they can teach you a lot about yourself. It was an interesting piece. I went right out and bought the book. Several years later I had the means and opportunity to spend time at Miraval Resort and Spa. It’s as beautiful, spiritual and healing a place you can find and I felt blessed to have had the presence of mind to get myself there. It’s also the place where Wyatt Webb runs the horse program. I had known he was there since the Oprah episode and vowed to get there one day. Well, one day was here and I was sitting in a room with several others for the seven day intensive program. It was an amazing experience. One I would recommend to anyone. The day I found myself standing in the arena next to Wyatt and a horse with an audience of 9 watching and listening while he asked me questions about myself was surreal. Even more surreal was when he decided the best way to get me in touch with my inner self was to blindfold me before he had me lift the horses hoof so I could clean it using nothing but my energy and body language. I’ve been back several times and have had life changing experiences each and every one of them. I realized I was drawn to horses for a reason. 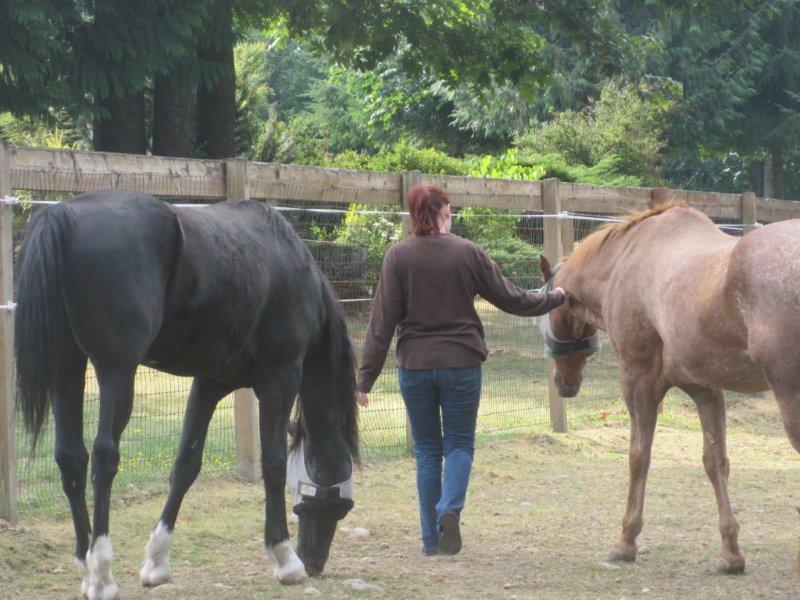 A year or so later I was fortunate enough to find an equine therapist near my home. A wonderful woman with an amazing herd of four horses. We have been working together for the past five years and I have become a member of this herd. The acceptance and reflection I have received from these sessions is indescribable. I have grown more as a person from Equine than from any other therapies I have participated in. One of my favorite ways of being of service is to muck stalls or groom my herd. I say “my” herd but they don’t legally belong to me. As a matter of fact they don’t belong to me at all. Actually, I feel as if I belong to them. I believe all creatures big and small have just as much right on this planet as I do. My sessions with the horses have reinforced that belief time and time again. So, if you need a spider removed from your house or a fly needs rescuing… call me. This entry was posted in Horses and tagged Animal, Equine, Equine Therapy, Herd, Horse, It's Not About The Horse, Living Creatures, Meditation, Oprah, Reflection, Wyatt Webb. Bookmark the permalink.